Mapmaking involves many disciplines at once: it is cultural, philosophical, visual and also mathematical. 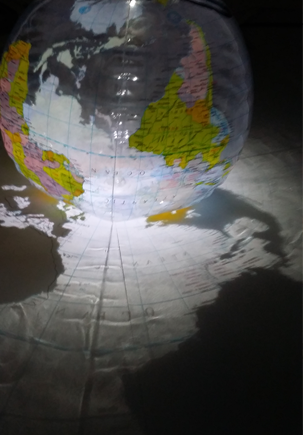 This last aspect reveals itself in the simple difficulty of transferring a pattern — in this case the pattern of the continents — from a roughly spherical surface to a flat one. It turns out that making a perfect map is impossible. We always have to give up on some kind of fidelity to geometric properties such as distance, angle or size. What you choose to sacrifice depends on the purpose of the map and the preferences of its maker, but you must sacrifice something. What’s more, and perhaps even worse than those other properties, it’s impossible to preserve “closeness” everywhere, so that there will always be some places that are close together on the real globe but far apart on the map. So the problem is topological as well as geometric. We looked briefly at some medieval maps, especially the Hereford Mappa Mundi. Although people knew very well at that time that the world is round, these depictions tend to be very flat-looking and the roundness of the Earth doesn’t seem to pose any great problem. 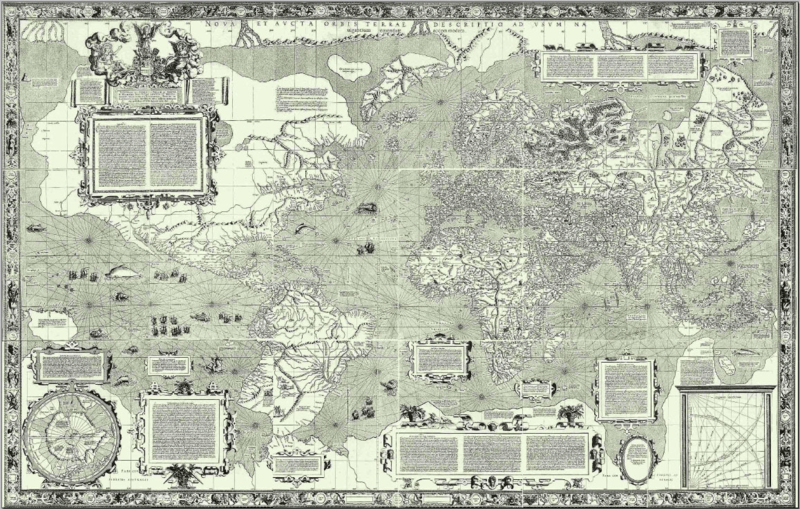 This was changed somewhat by the discovery of the Americas at the end of the 15th century. 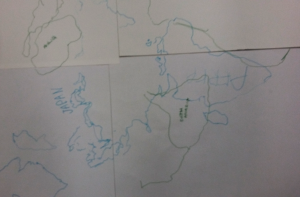 In class we made our own maps using a rather different technique, called stereographic projection. 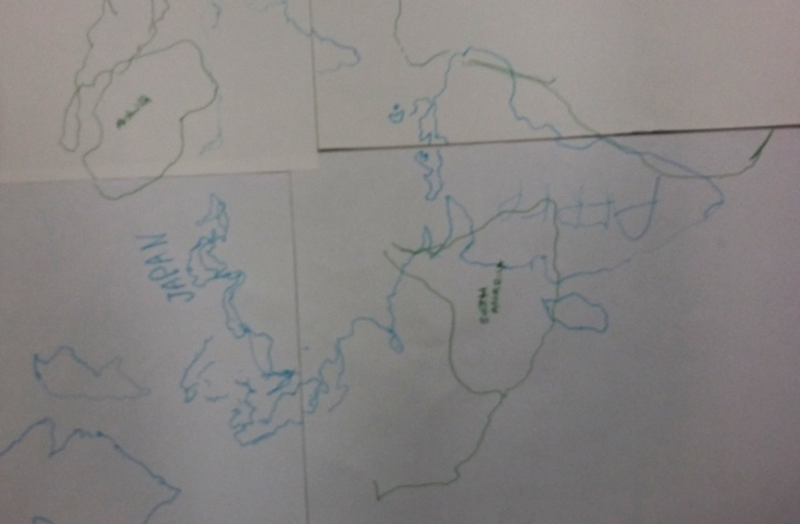 It’s awkward to do by hand and produces some very severe distortions, but it has an interesting geometric relationship to the Mercator projection — we discussed that in class, using images from this excellent article. We’re interested in this for a few reasons. One is that we’ll be using this technique, and others very like it, in later sessions. Stereographic projection is one of those tricks that comes up surprisingly often in maths, and in all kinds of weird contexts, so it’s good to know about. But since this course is about the interplay of geometry and topology, the problem of transferring designs from spheres to planes is very pertinent anyway. In fact, this coming week we’ll look at the opposite problem — confronted by Islamic artisans in the middle ages — of transferring patterns from flat drawings onto domes and spheres. The difference between the sphere and the plane is topological, but that’s quite hard to “see”. The geometric effects of this difference, though, are plain to see, and will be even plainer in the next session.